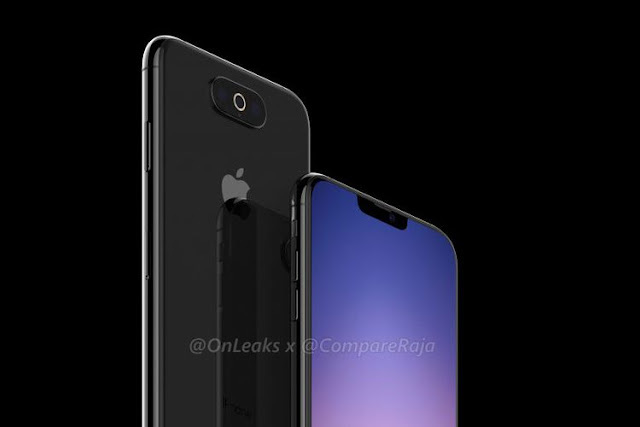 Technology-Portfolio.Net - Even though it is still far from the day of the launch of the new iPhone which is usually released in the third quarter of each year, this leaked line of iPhones for 2019 continues to emerge. After reportedly going to use three rear cameras arranged in a zig-zag manner, times a rendered image shows what the three alternative cameras are like. The above leak first appeared on the Comperaja.in page. In the visible picture the three iPhone XI cameras on the back are arranged horizontally in a row, just above the Apple logo. The three cameras are wrapped in one container. Visible cameras placed in the center have brighter edges. Maybe this part doubles as a flash LED. While on the front, according to the rendering image, Apple does not want to embed a "hollow screen" which is now starting to become a trend among smartphone makers. The iPhone XI still has bangs on the screen. The design of the device which is the reference for the rendering image is reportedly still in the stage of the Engineering Validation Test (EVT). At this stage a basic function of a product is tested to check whether the unit can function or not. The production of the iPhone XI is still at a very early stage and there is still a possibility of major changes in terms of design until the day of its launch. It is estimated that Apple will launch the line of the 2019 iPhone in September as usual. There is a possibility that the line of the iPhone 2019 will return to consist of three models.